How Rudolf von Ribbentrop, the son of the German foreign minister, survived a day of heavy fighting during the Battle of Kursk. by George M. Nipe, Jr.
On the morning of July 12, 1943, a climactic engagement of the Battle of Kursk was about to take place. The last fortified elevation on the road leading to the key town of Prokhorovka, designated as Hill 252.2, had been taken by the German 1st SS Panzergrenadier Division “Leibstandarte” after ferocious fighting on the previous day. 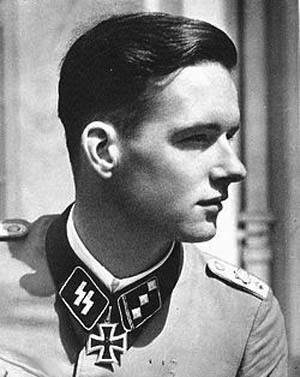 The blasted, smoldering hill was occupied by the division’s half-track battalion, commanded by SS Standartenführer (Colonel) Jochen Peiper. Operating in the gap between the two divisions were elements of a Soviet tank brigade that posed a constant threat to the single dirt road that was Leibstandarte’s main supply route. Leibstandarte commander General Theodor Wisch sent his Aufklarüngsabteilung (reconnaissance battalion) into the gap, but the battalion’s light armored cars and half-tracks could not take on Russian tanks in a pitched battle. In spite of this potentially dangerous situation, the commander of the II SS Panzer Corps, SS Obergruppenführer (Lt. Gen.) Paul Hausser, intended to attack and capture Prokhorovka on July 12. Hausser and chief of staff Werner Ostendorff planned to assault Soviet forces defending Prokhorovka from three sides. The most important role in the attack was assigned to Totenkopf, commanded by SS Brigadeführer (Brig. Gen.) Hermann Priess. At first light, the 100 tanks of Totenkopf’s panzer regiment would cross the Psel River west of Wassiljewka, then push six kilometers northeastward to the Karteschewka-Prokhorovka road. This road extended across the width of the Psel River bend, from Karteschewka on the west to the village of Petrowka, which was five kilometers northwest of Prokhorovka. Having crossed the Psel River at that point, Totenkopf’s panzers could strike into the rear of the Soviet troops defending Prokhorovka, as well as eliminate a key Soviet artillery position. The subsequent destabilization of the Soviet defensive position would signal the beginning of the second phase of Hausser’s attack, which was to be carried out by Leibstandarte’s panzers. Commanded by SS Obersturmbannführer (Lt. Col.) Georg Schönberger, the panzer group included Leibstandarte’s tank battalion, the half-track battalion, and various support vehicles. Taking advantage of the expected disruptive effects of Totenkopf’s attack, Schönberger was to attack Prokhorovka from the west. In the next phase of the attack, Das Reich’s Regiment “Deutschland” was to smash through the Soviet front southwest of Prokhorovka. When Regiment Deutschland penetrated the Soviet defensive position, Das Reich’s panzer group, stationed two kilometers behind the front at the village of Oserowskij, was to strike through the gap, then turn south and roll up the Russian line parallel to the division’s front. This attack was intended to seize forward positions from which to attack Prokhorovka from the south. Hausser’s plan of attack emphasized mobility and surprise in order to attack the Soviet forces defending Prokhorovka. It was a classic German panzer operation featuring sequential assaults upon Prokhorovka from the north, south, and west. The plan was a good one and would probably have worked if Prokhorovka had been defended only by the exhausted Soviet infantry and combat-weakened tank brigades that the German juggernaut had decimated in seven days of battle. However, unknown to Hausser and Fourth Panzer Army commander Col. Gen. Hermann Hoth, the plan would be upset by the arrival of strong formations from the Soviet strategic reserve. The 5th Guards Army’s 33rd Rifle Corps with three rifle divisions and Lt. Gen. P.A. Rotmistrov’s 5th Guards Tank Army arrived throughout July 11. The 5th Guards Tank Army, assembled in and around Prokhorovka, possessed about 590 tanks and would be supported by more than 200 tanks of the 2nd and 2nd Guards Tank Corps. The II SS Panzer Corps records show that the three SS divisions possessed 232 operational tanks on the morning of July 12, 1943. In spite of postwar German officers’ claims to the contrary, no doubt due to embarrassment, these very substantial Soviet forces had arrived completely undetected by German intelligence or air reconnaissance. There is no mention of any unit of Rotmistrov’s army, the 33rd Rifle Corps, or the observation of large movements of Soviet armor in the intelligence records of either the II SS Panzer Corps or the Fourth Panzer Army before the battle. Rotmistrov intended to launch a powerful frontal attack with the 18th and 29th Tank Corps against Leibstandarte and elements of Totenkopf. He planned to attack Das Reich with the attached 2nd and 2nd Guards Tank Corps. Rotmistrov held the powerful Guards Mechanized Corps, equipped with 212 tanks, in reserve. The 29th and 18th Tank Corps were to advance from Prokhorovka through a five- kilometer-wide corridor that extended to the southwest from Prokhorovka. The corridor was bordered by the Psel River on the northwest and a 30-foot-high railroad embankment to the southeast. During the night, as the Russian tanks assembled, the roar of great numbers of tank motors was heard by German forward observers, and the corps records mention this fact, but no one could say what the motor noise meant. Early on the morning of July 12, all uncertainty was removed. Major General I.F. Kirichenko’s 29th Tank Corps attacked through the southern half of the corridor with all three brigades of his corps on line—a total of about 170 T-34s and T-70s. The 31st and 32nd Tank Brigades, with perhaps 120 tanks, converged upon Hill 252.2. South of the rail embankment, the 55 tanks of Kirichenko’s 25th Tank Brigade, supported by the 169th Tank Brigade, charged toward Leibstandarte’s 1st SS Panzergrenadier Regiment. Kirichenko kept none of his armor in reserve, gambling that he would overwhelm the German defenders in the first wave. Major General B.S. Bakharov’s 18th Tank Corps advanced through the northern half of the Psel corridor on Kirichenko’s right. The more than 60 tanks of the 181st Tank Brigade, commanded by Lt. Col. V.A. Puzyrev, headed directly toward Wassiljewka. The 60 tanks of the 170th Tank Brigade, commanded by Lt. Col. V.D. Tarasov, were on Puzyrev’s left, and passed north of Hill 252.2. Bakharov held his 110th Tank Brigade and the 36th Heavy Tank Regiment in reserve. To the south, the 2nd and 2nd Guards Tank Corps roared from their assembly areas toward Das Reich’s positions with perhaps 200 tanks between them. When the attack began, the commander of the only German tanks near Hill 252.2, Rudolf von Ribbentrop, was asleep. Obersturmführer (First Lieutenant) von Ribbentrop, the commander of Leibstandarte’s 6th Panzer Company, did not have to be in Russia in 1943. He was the son of German Foreign Minister Joachim von Ribbentrop, and since he had three years of combat experience by the summer of 1943, he undoubtedly could have obtained a soft military post in Germany. However, Ribbentrop chose to fight with his comrades, in a division that was always at the hottest spots on the Eastern Front. On July 12, he experienced combat so terrible and violent that he would feel born again to have survived the inferno. When the 5th Guards Tank Army began its attack, Ribbentrop’s 6th Company, with only seven operational Panzer IVs, was in reserve a short distance west of Hill 252.2. The other companies of the panzer battalion were dispersed farther to the west in the direction of the Oktjabriskij State Farm. It was expected that it would take hours before Totenkopf’s panzers could reach the Karteschewka highway, strike down its length, cross the river, and then attack Prokhorovka from the rear. Many of the Leibstandarte tankers were fast asleep, even though the rumble of heavy guns could already be heard in the distance. By 8 am, artillery boomed from the north, announcing that Totenkopf was about to begin its drive toward the Karteschewka highway. Tags Axis, Battle of Kursk, Eastern Front, Germany, Nazi Germany, Panzer, Prokhorovka, Red Army, Rudolf von Ribbentrop, Soviet Union, Tank Corps. My name is Jacob, a student in Taiwan, also a big fan of WWII history. Would you kindly advise me the contact information of Rudolf von Ribbentrop? I might able to arrange an interview for him, for a project of magazine, if the chance still exists. I thank you enormously ,and God bless you.